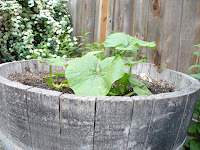 It's been a little over two weeks since our little pumpkin plant went to ground. And it's not so little any more. Leaves are peaking -- well, almost leaning -- over the sides of the whiskey barrel and it's slowly but surely spreading out, testing its boundaries. And we have the start of blossoms -- at least five or so. I'm proud of my pumpkin nurturing. At the recommendation of a dog-walking friend, I water about every other day (seems the cherry tomatoes are liking this too) and will give it another round of plant food tomorrow. So far, so good, and so much bigger. However, I must confess to a little mental "gulp" this a.m. I stopped in and had a quick cup of coffee with friends while walking the dog. 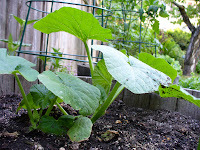 They regaled me with the story of their year of the pumpkin-- when one plant took over a flower bed, grew over a fence and proceeded to take up residence in the neighbor's yard. I'm looking at my pumpkin plant with new-found respect.